November 22, 2004-The Crocodile Hunter Says G’Day to The Marine Mammal Center -- Animal Planet’s Steve Irwin learns pinniped medicine from The Center’s staff for new television series. Baker D., a bottlenose dolphin patient was released into Monterey Bay just off of Moss Landing, this morning, November 17th. He was released within the vicinity of approximately 20-30 bottlenose dolphins. According to the crew on the boat, the cetacean swam away rapidly, and is breathing and surfacing normally. On Friday, Nov. 12, Baker D. was satellite tagged. The Marine Mammal Center expects to be able to monitor his travels via that satellite tag for about three months, to learn more about his travel and diving patterns and we will be alerted if he should strand again. Click here for pictures! Baker D. has been quite active since his release on November 17. As of 11/22 he was tracked northwest of Point Pinos in Monterey. Previously, he made his way to Half Moon Bay and near the Davenport area. Here's a map with the best quality data transmitting from Baker D’s satellite tag so far. The tag transmits each day from 5-9am PT so marine biologists get a cluster of points each morning in order to pinpoint his location accurately. He appears to be staying offshore and diving normally. December 8, 2004- Baker D's been traveling quite extensively since his release into Monterey Bay three weeks ago. He initially swam north to the Half Moon Bay area, then turned around and went south all the way to the Channel Islands. He gave us a bit of a scare over Thanksgiving weekend when he stayed in the same place for three days just off Santa Rosa Island, possibly indicating he was in trouble. Since then, he has been on the move again just off of the island and spent nine days northwest of the Channel Islands. On December 4, his radio tag alerted researchers at Moss Landing Marine Labs that he was diving regularly near Point Conception. January 5, 2005- As of January 4, 2005, Baker D. continues to stay offshore and is diving around the Channel Islands area. Point 42 on the map is the last spot plotted as of 12/30/04. February 24, 2005- The Southwest Fisheries Science Center has notified The Center about Baker D’s genetic sample and he appears to fit genetically with the offshore stock of dolphins. This is wonderful news because it explains why he did not stick around with the dolphins in Monterey Bay. From his satellite tag we know he traveled south to the Channel Islands and has been hanging out down there ever since. The Center stopped receiving transmissions from the satellite tag at the end of January. On Feb. 18, marine biologists boarded an airplane and successfully found Baker D. via his radio tag which is still working. They could not see him, but they did see a big pod of around 70-100 dolphins, and from the radio transmissions, they think he was a part of it. He was diving normally and his radio tag sounded fine. (SAUSALITO, Calif. – September 23, 2004): The Marine Mammal Center is currently rescuing and treating an unusually high number of California sea lions affected by an outbreak of a bacterial disease called leptospirosis. This disease impacts the kidneys and if not diagnosed and treated early, can be fatal. More than 45% or 142 of the 309 sea lions The Center has rescued so far this year have been diagnosed with leptospirosis; nearly half of that number died from the disease. Comparatively, in 2003, only 4.6% or 28 of the 607 sea lions rescued by The Center were diagnosed with leptospirosis. “Leptospirosis epidemics were first documented in California sea lions in the early 1970s,” said Dr. Frances Gulland, The Marine Mammal Center’s Director of Veterinary Science. “We’ve noticed that the occurrences are cyclical in nature, with an outbreak occurring every three to four years. We are still not sure why this is, but we continue our studies and research to better determine the origins of leptospirosis, and hopefully to find solutions to lessen future outbreaks,” said Gulland. Leptospirosis is a disease caused by spiral shaped bacteria called leptospires. The disease can be serious for both humans and animals. In people, the symptoms are often like the flu, but sometimes leptospirosis can develop into a more severe, life-threatening illness with infections in the kidney, liver, brain, lung, and heart. The bacteria are spread through the urine of infected animals, which can get into water or soil and can survive there for weeks to months. Humans and animals can become infected through contact with this contaminated urine, water, or soil. If not treated, the patient could develop kidney damage, meningitis, liver failure, and respiratory distress. In rare cases, death can occur. (SAUSALITO, Calif. – September 15, 2004): The Marine Mammal Center is proud to announce that its Annual Gala Celebration will be held on Thursday, October 21st 2004. This year’s celebration not only looks back at the past 30 years of achievements in rescuing and rehabilitating sea lions, elephant seals, otters, porpoises and other marine mammals, but it will also treat guests to a glimpse of The Center’s future. The gala will be held in the historic San Francisco City Hall. The evening includes a cocktail reception beginning at 6:30PM in the Rotunda Balcony. A gourmet dinner in the Rotunda will follow, and dessert and dancing in the South Light Court will round off the evening’s festivities. The Gala Celebration is The Center's annual ticketed fundraising event. “Our gala celebration gives us the opportunity to say thank you to so many people who help us continue our mission year after year and it also allows us to introduce ourselves to those who are not familiar with our work, yet would like to be involved,” said B.J. Griffin, executive director at The Center. “Moving forward in the next 30 years, we strive to better our capabilities in order to respond to the needs of our ocean friends,” said Griffin. Dan McCall (McCall Associates) is creating a special menu for the event – highlights include White Corn Soup, Red Braised Lamb Shank and Petite Custards along with a delectable dessert buffet. A vegetarian dish will also be offered. Lavay Smith and Her Red Hot Skillet Lickers will provide music throughout the evening. (SAUSALITO, Calif. – August 27, 2004): The Marine Mammal Center, along with the San Francisco Giants and Chevron will host the second annual Marine Mammal Day at SBC Park in San Francisco on Saturday, September 4th. This special day at the ballpark is designed to educate fans and inspire action to protect marine mammals and their environment. Giants’ mascot Lou Seal has adopted The Center as his official charity and will participate in several events at the ballpark and at The Center throughout the season. The Center, is a rescue and treatment hospital for ill or stranded seals, sea lions and porpoises and other marine mammals. During the September 4th game between the Arizona Diamond Backs and the San Francisco Giants, fans will have the opportunity to buy limited edition commemorative pins featuring Giants’ mascot Lou Seal and his otter friend. Raffle tickets will be sold for chances to win great prizes such as an official major league baseball autographed by Barry Bonds, a 2002 World Series game-used base, and even hundreds of dollars of free gas, courtesy of Chevron. All net proceeds go directly to The Center. Each year The Center educates 40-thousand school children. The Junior Membership program is designed to continue kids’ interests by engaging them through newsletters and interactive website activities. Tickets for the Sept. 4th game are available by logging onto www.marinemammalcenter.org. The Marine Mammal Center celebrates its 30th anniversary in January, 2005. 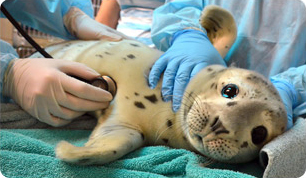 The non-profit hospital is dedicated to the rescue and rehabilitation of marine mammals that are found ill, injured or orphaned, along 600 miles of northern and central California coastline. Since 1975, The Center has treated over 10,000 California sea lions, elephant seals, sea otters, harbor seals and other marine life. It uniquely combines its rehabilitation program with scientific discovery and education programs throughout the Bay Area and the world, to advance the understanding of marine mammal health, ocean health and to promote conservation. (SAUSALITO, Calif. – July 8, 2004): Officials from The Marine Mammal Center performed a necropsy on a male California sea lion, named “Shopper,” and determined that the animal died as a result of a gun-shot wound to the head. The animal had become a regular sight up in the Petaluma river area where local store owners first spotted him, and gave him the name “Shopper” last month. The Center rescued the pinniped on June 18th, transporting the 286-pound animal to its main hospital in Sausalito. There, Shopper was examined, and given a clean bill of health to be released. Volunteers and staff released Shopper at Drake’s Beach in Point Reyes National Seashore on June 22nd. Days later, he made his way to the Napa River, and eventually to a vineyard where he was found dead. Officials from The Center notified The National Marine Fisheries Service (NMFS) about the shooting. An investigation is pending. Anyone with information about the shooting is asked to call NMFS’ hotline at 1-800-853-1964. It is illegal to shoot, harm or harass a marine mammal under the Marine Mammal Protection Act of 1972. (SAUSALITO, Calif. – June 7, 2004): The Marine Mammal Center, a non-profit hospital, rescue and research facility for ill and stranded sea lions, elephant seals and other marine mammals, is proud to announce it has hired veteran public relations executive and former broadcast journalist, Jim Oswald, to head up and develop its public relations and communications program. Prior to his joining The Center, Oswald had been the principal and founder of Oswald Media Communications, a PR consultancy with clients primarily in the San Francisco Bay Area. “I’m ready for a refreshing and rewarding job that I can be passionate about;” said Jim Oswald. “The Center’s dedication to bettering our knowledge about marine mammals has inspired me to want to help it communicate its news, milestones and research, to the world. Mr. Oswald will be the day-to-day contact for journalists’ inquiries. He’ll also manage and run The Center’s communications program, which includes its website, public outreach and response initiatives, along with other media relations activities and communication strategies. He has more than 10 years of combined experience as a radio reporter, television news producer and as a public relations executive. Mr. Oswald is a member of The Golden Gate Business Association, National Lesbian Gay Journalist Association and was a distinguished guest lecturer at San Francisco State University - College of Business Management & Marketing. He received his Bachelor of Science degree in television and radio news broadcast from California State University, Fresno. In his spare time, he is a correspondent for Sirius Satellite Radio’s OutCue News program. (SAUSALITO, Calif. – April 29, 2004): The Marine Mammal Center a non-profit marine mammal hospital, rescue and research facility, continues its disease studies on domoic acid toxicity, to learn the long-term neurological effects of past exposure on California sea lions. The Center hopes to gain knowledge on how best to treat lesions associated with the toxin, in order to increase the animals’ survival back into the wild. Domoic acid is a type of poison produced by harmful algae blooms. Anchovies, sardines and other shellfish are exposed to the poison and then ingested by marine mammals. This affected seafood can cause seizures and death in animals, and in humans. It’s believed that domoic acid may be the recent cause of illness, and in some cases, death of approximately 20 California sea otters in the Morro Bay area. Domoic acid toxicity was first diagnosed in 1998 in 70 California sea lion that were admitted to The Center. Since then, more species, such as otters, harbor seals, porpoises and dolphins, have also been affected by domoic acid. In addition, the poison now occurs throughout the year, and has been found in water all along the California coastline, from San Francisco south. In 2003, 66 animals were diagnosed with domoic acid poisoning at The Center. Because staff veterinarians are now more able to quickly identify the problem and begin care, the survival rate has risen to 68%. The Marine Mammal Center will track Chippy’s travels to monitor his progress in the wild. (SAUSALITO, Calif. – March 3, 2004): The Marine Mammal Center (http://www.marinemammalcenter.org) will release “Chippy,” an adult California sea lion, into the ocean near Point Reyes National Seashore, Wednesday, March 3rd . Point Reyes is one of the few spots that The Center releases patients because it is protected on National Park Service property, and it provides a natural habitat and food source for sea lions. Veterinarians from The Center have also attached a monitoring device that will help scientists follow Chippy’s rehabilitation and ensure that he successfully readapts to his ocean home. Chippy was found by CHP officers near Los Banos on February 9th. The 315-pound adult California sea lion made news headlines and television broadcasts around the world after his amazing journey down the San Joaquin River channel, some 65-miles away from the ocean. Chippy, as he was named by officers, was rescued by staff and volunteers from The Marine Mammal Center’s Monterey Bay operations, then transported to The Center’s main Sausalito hospital facility for medical attention. Upon examination and x-rays, veterinarians at The Center’s hospital discovered a bullet lodged in soft tissue just behind Chippy’s skull. The bullet was removed by veterinarians and Chippy recovered nicely at The Center. The bullet was turned over to the National Marine Fisheries Service where an investigation into who may have shot the pinniped is ongoing. Shooting of a marine mammal is a crime under the Marine Mammal Protection Act of 1972 and carries with it fines as hefty as $20,000. “We are so happy that the story of Chippy’s adventures is ending happily,” said Cynthia Schramm, membership and communications director for The Marine Mammal Center. “We’re also amazed and thrilled at the public’s positive response to cheering Chippy to recovery.” In all, The Center and the California Association of Highway Patrolmen raised nearly $28,000 that will go towards the costs associated with taking care of Chippy as well as other patients like him. (SAUSALITO, Calif. – February 27, 2004): Spring is in the air, and in Northern California that means for the next few months, female Pacific harbor seals will give birth to their pups. These beautiful animals are irresistible to look at, especially to residents and site-seers in and around the Pt. Reyes National Seashore, Bolinas, Richmond, Sausalito and Pescadero areas. Unfortunately, good-intentioned people may see a harbor seal pup on a beach and be tempted to coax it back into the water, touch it, or worse, pick it up, thinking that it needs their help. This does more harm than good. Seals are easily stressed by humans. Further, a young pup’s best chance for survival is to remain with its mother. The Marine Mammal Center asks for the public’s help in protecting these animals by not disturbing or harassing them. After giving birth, harbor seal mothers will leave their pups on beaches and rocks in order to hunt for fish offshore. Sadly, in too many cases the females returned to find their pups gone. Last year, 43% percent of harbor seal pups rescued by The Marine Mammal Center were either harassed or illegally picked up by humans. That’s nearly double the number of similar interventions The Center completed in 2002. Under the federal Marine Mammal Protection Act of 1972, it is a crime to harass or injure marine mammals; to do so is punishable with heavy monetary fines. Stay back at least 50 feet from it. Its mother may be just around the corner. Keep other people and dogs away. Call The Marine Mammal Center’s 24-hour hotline at 415.289.SEAL. (SAUSALITO, Calif. – February 12, 2004): The Marine Mammal Center (www.marinemammalcenter.org) and the California Highway Patrol are raising funds to help offset the medical costs related in caring for a wayward sea lion found some 65 miles away from the ocean. “Chippy”, named by the CHP officer who found him, was found near The Central Valley city of Los Banos on Feb. 9th. The 315 pound adult California sea lion made his amazing journey down the San Joaquin River channel, eventually resting on top of a CHP squad car. Rescuers from The Center’s Monterey Bay operations herded Chippy into a cage and transported him by truck to the main Sausalito hospital for medical attention. Upon examination and x-rays, veterinarians at The Center’s hospital discovered a bullet lodged in soft tissue just behind Chippy’s skull. It is not known exactly how long this bullet has been inside the animal’s head, or if it will adversely affect the animal’s health. “Nearly 8 percent of California sea lions admitted to The Center suffer from gun shot wounds, most to their heads,” said Cynthia Schramm, communications and marketing director for The Marine Mammal Center. “Under the Marine Mammal Protection Act of 1972, it is illegal to injure or harass marine animals and there are heavy fines for this type of crime. Now our main goal is to take care of Chippy and help him get back to his ocean home,” said Schramm. The Center, along with the California Association of Highway Patrolmen, is fundraising to help pay for the food, medical attention and care Chippy and other patients like him need. Donations can be made either online via The Center’s website at www.marinemammalcenter.org or by mail to the CAHP Sea Lion Fund c/o The CAHP, P.O. Box 161209, Sacramento, CA 95816. The Marine Mammal Center is a non-profit hospital dedicated to the rescue and rehabilitation of wild marine mammals that are ill, injured or orphaned, along 600 miles of northern and central California coastline. Since 1975, The Center has worked with over 10,000 California sea lions, elephant seals, sea otters and other marine life. It uniquely combines its rehabilitation program with scientific discovery and education programs throughout the Bay Area and the world, to advance the understanding of marine mammal health, ocean health and to promote conservation. (SAUSALITO, Calif. - January 7, 2004): The Marine Mammal Center is proud to present the 22nd annual Run For The Seals race, Saturday, March 13, 2004 at Rodeo Beach in the Marin Headlands, Sausalito. The four-mile race begins at 9am and is open to runners, walkers, families with baby joggers and even dogs. Proceeds benefit The Marine Mammal Center. Prizes will be awarded to top finishers in various age categories and all registrants will receive a commemorative Run For The Seals t-shirt. New this year, The Center will host an online silent auction starting in February. Top items up for auction are a Sea Lion Celebration behind-the-scenes tour and a Dolphin Discovery tour from Six Flags Marine World in Vallejo. Runners and supporters will enjoy music from KFOG, some delicious food and coffee, vendor booths and they’ll be able to learn more about The Center through docent led tours. Online pre-registration for the Run For The Seals race is available for $25 through March 4th 2004. Registration by mail is $27. All entries must be postmarked by midnight February 28th in order for race bibs to be sent out. After the 28th, bibs can be picked up on the day of race. Race-day registration is available for $32. Race-day check-in begins at 7:30am. For more information, to register and to participate in the silent auction, log onto the website at www.runfortheseals.org or call the race hotline at (415) 289-0188. Run For The Seals is proudly sponsored by Six Flags Marine World, Vallejo, Ch. 5 KPIX/ Ch. 44 UPN-TV, KFOG-FM, The Marin Independent Journal, Autodesk and RE/MAX. (SAUSALITO, Calif. – February 3, 2004): On Saturday, February 28, 2004 The Marine Mammal Center (http://www.marinemammalcenter.org ) a hospital for ill and stranded sea lions, harbor seals and other marine life, hosts its third annual marine mammal rescue seminar. This free, fun and informative class teaches participants to identify, assess and respond to ill, injured or stranded marine mammals in the Bodega Bay Area. The class, taught by Erin Brodie of The Center’s Stranding and Rescue Department, will include an overview of The Center’s rehabilitation efforts, and instruction in beach safety, assessing the condition of marine mammals, and rescue procedures. With a main facility located in Sausalito and field offices in Monterey, San Luis Obispo and Mendocino County, The Marine Mammal Center rescues approximately 550 mammals per year, thanks to the help of its network of more than 800 volunteers. The class will be held at the Bodega Bay Grange Hall located at 1370 Bodega Bay Ave.
* Note: The afternoon session will be held outdoors: location TBA during the morning session. Please wear long pants, closed toe and closed heel shoes, and dress warmly (layers advised) if you plan to participate in the rescue procedures class. Leather gloves also recommended. For more information or to RSVP please contact Shelbi Stoudt at (415) 289-7357 or stoudts@tmmc.org.